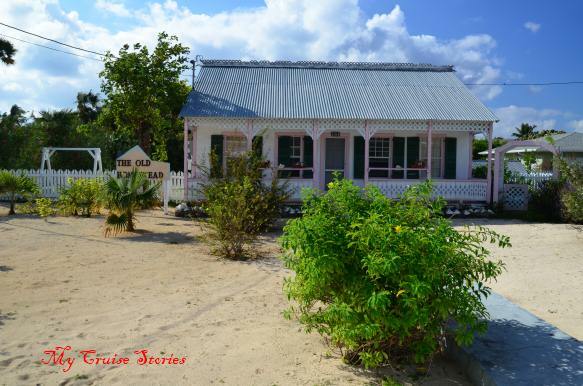 Ever since our last visit to Grand Cayman, we decided the next time we went there we’d take the local island tour. On our last visit I had a wonderful time on the Kittiwake wreck and reef snorkel excursion. This time we wanted to see more of the island. We caught the first tender to shore from the Norwegian Pearl. 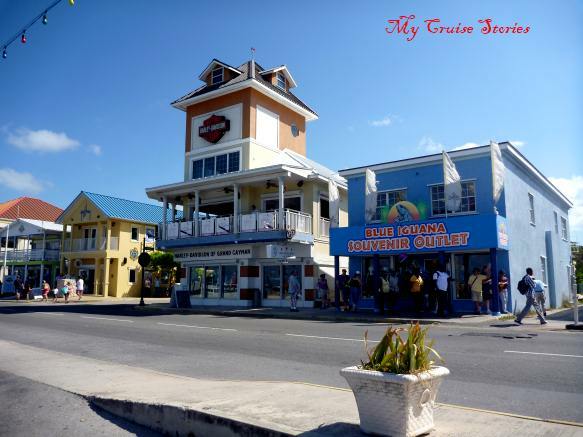 The tenders take us into Georgetown, the capitol of the Cayman Islands, where cruise ships anchor just offshore. We had no trouble finding an island tour. A lady stood right near the exit from the tender pier with a sign. Usually when we take these sort of tours it’s just a random thing we happen across, but this time we knew we could find one and had planned to do so, which meant it was not really a random bus tour. It took a little time for her to gather enough people for the $20 tour, so we looked around the shops for a bit first. As she drove across the island, our driver/guide, Josephine told us all about the things we passed along the way from the governor’s house to the million dollar condos to the historic house that survived a hurricane that devastated the modern house across the street. The governors come from England for a 4 year term, and she said all of them are rich. Our bus soon stopped in Hell. 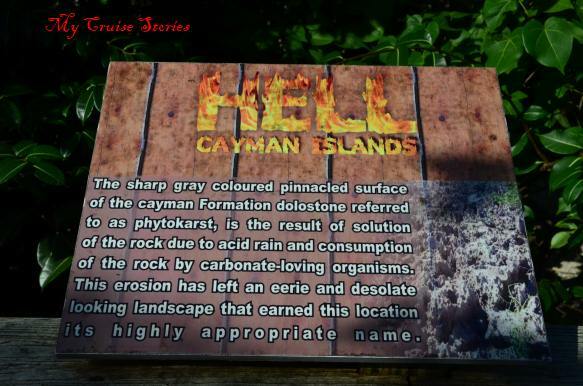 There’s not much there, it’s the name that made Hell, Grand Cayman a tourist attraction. 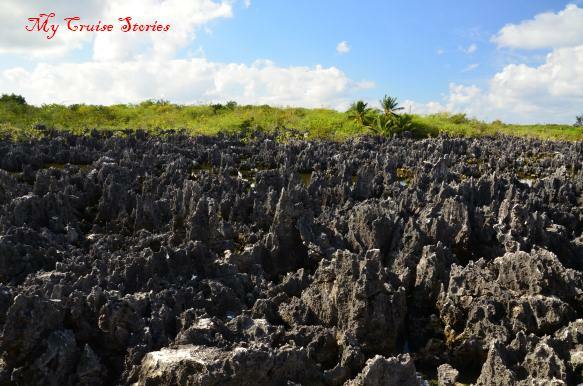 Limestone rock formations gave the place its name. 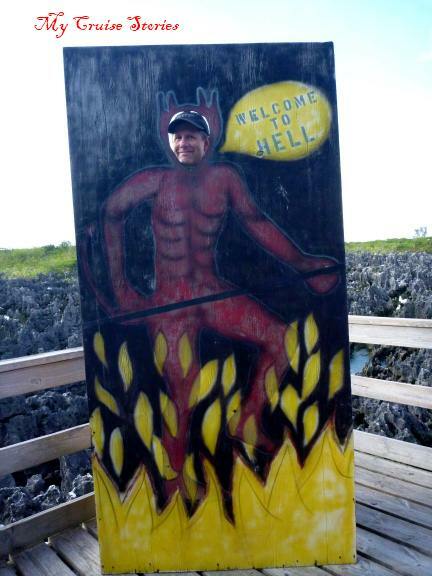 Mainly people go there to say they’ve been to Hell, or perhaps to mail a postcard from Hell. When you see signs of Hell does it mean the end is near? Who did you expect to find here? There’s a little gift shop, a post office, and a place to view the rocks. I meant to send a postcard to my day job. I intended to write I may be in Hell today, but I’m still having more fun than you are, or something to that effect on it. We didn’t have much time there and by the time we got done taking photos I didn’t have time to wait in line to buy or mail a postcard, so I didn’t get to send a postcard from Hell. 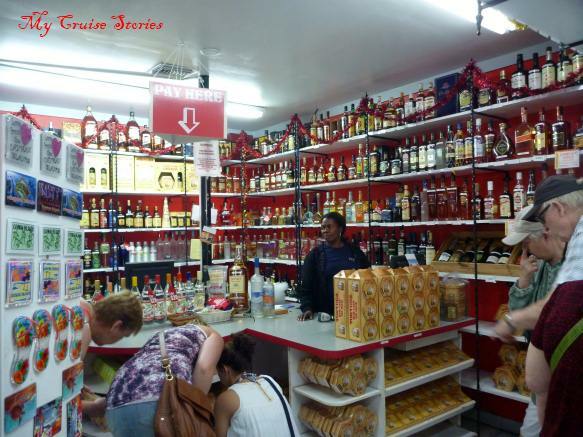 Our tour stopped at the local rum cake factory where they offered free tastes of rum as well as rum cake. The rum cake was actually quite tasty. My husband usually just drinks wine, but he tried coconut rum and liked it. The shoreline near the shop had more of the limestone rocks where water came splashing through a channel when big enough waves came in. Lots of birds hung around the rocks. Not far down the road, a turtle farm sat across the street from a dolphin place. The turtle farm charged $10 admission, so everyone on our bus chose to see the dolphins as they let us in for free. Of course the people in the pool swimming with the dolphins did not get in for free. It looked like they had a good time though. 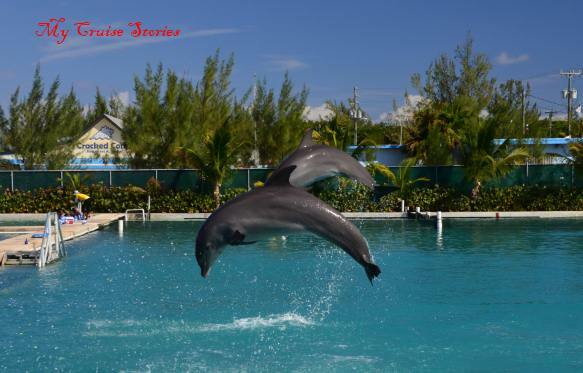 Dolphins performed tricks like jumping in the air or swimming along waving a fin. Some of the people got a ride on a wakeboard pushed by dolphins, others rode on the dolphin. I think a dolphin swim excursion would be quite fun, but they always cost more money than I want to spend. We anchored up near Grand Cayman with 5 other cruise ships. Thinking that was quite a lot, since last year when we came in on the Carnival Liberty it was just us and the Pearl, we asked our tour guide what was the most they would get in a day. She said 11. The islanders love having that many since tourism is their second biggest industry, next to banking. After the tour we had plenty of time left to wander about town. We took photos of all the ships in town that day. In addition to the Norwegian Pearl, which we came in on, we also saw the Holland America Nieuw Amsterdam, who had also been in Jamaica with us. Also the Royal Caribbean Freedom of the Seas, Carnival Magic, and the Coral Princess. I remembered the Coral Princess from my Alaska cruise on the Norwegian Sun. At that time in Alaska both those ships seemed big compared to the others cruising there. Now in the Caribbean the Coral Princess looked tiny, and the Sun is one of Norwegian’s smallest ships. We found all sorts of things to see in town. We wandered through some of the many jewelry stores, then noticed all sorts of things people could find to do if they got off the ship with no specific plans. 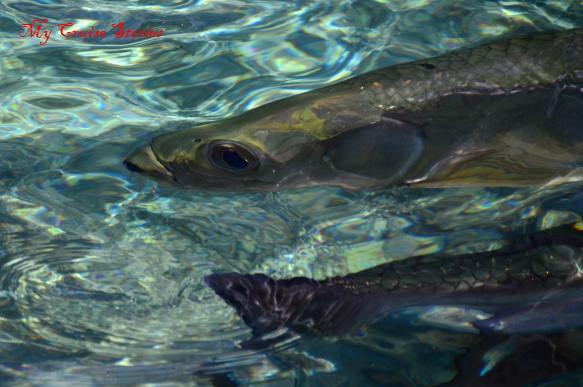 John especially enjoyed a school of tarpon fish hanging around the shoreline. As soon as you exit the ship plenty of locals offer shuttle rides to 7 mile beach for a few bucks, and for even less money a public bus goes there as well. 7 mile beach has just about everything for rent from jet skis to beach chairs. The island tour is easy to find, most likely someone will have a sign for that too. Just north of the Royal Watler pier there is a place that rents jet skis and other water toys. A bit further north we saw a helicopter ready to give rides. South of the south tender landing, a place called Paradise Restaurant sits on the water’s edge with an entrance to the marine park area below. They rent snorkel gear or people can bring their own. They also had beach chair and locker rentals. A stairway down the limestone formation at the water’s edge leads into waters where a school of tarpon hung around begging for food. Other places a short walk south also had snorkel gear rentals and access to the water. Walking down the street next to the water we also saw a place offering Atlantis submarine tours and a museum, and of course seemingly unlimited places to shop. 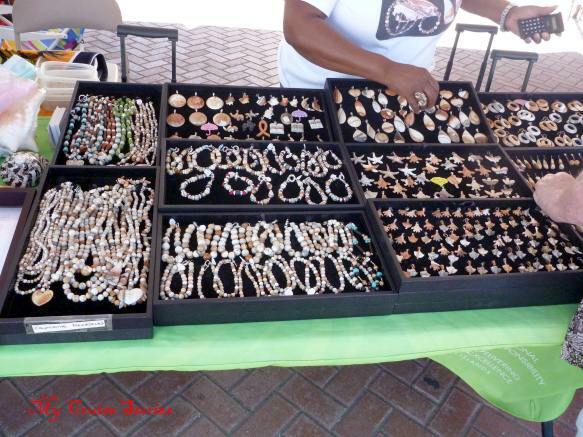 The cruise ships try to warn people away from anywhere but the stores they affiliate with, but we found great deals on Grand Cayman’s own local stone Caymanite at a local crafts market. A local artisan there said she sold the jewelry she made herself there to the tourists for the same price as she sold it to the stores (who then sell it to the tourists with their profit added in.) She had nicer pieces than any I actually saw in a store. She also had conch jewelry. 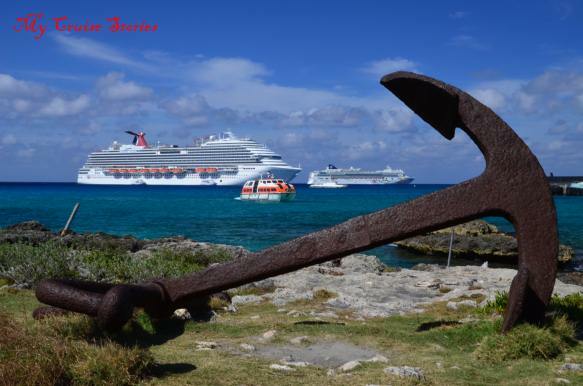 The cruise ships offer some great excursions in Grand Cayman too. We had lots of fun on the Kittiwake snorkel excursion on last year’s Carnival Liberty cruise. 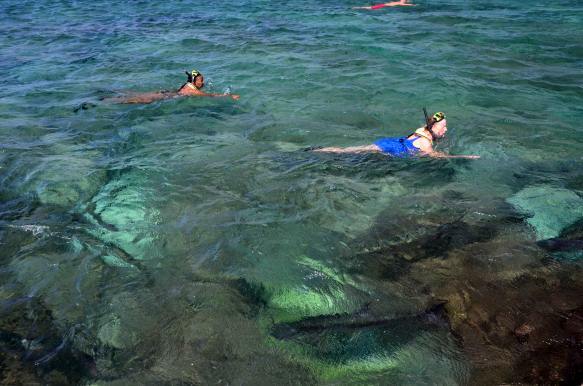 That excursion took us snorkeling over the intentionally sunk USS Kittiwake, the only US military vessel ever sold to a foreign government, and then to a reef. 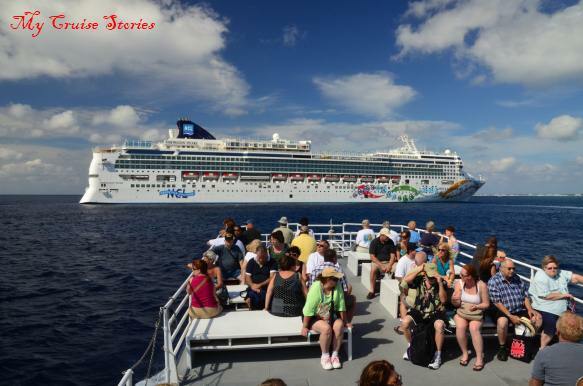 Other cruise ship excursions in Grand Cayman include island tours, brewery tours, stingray, dolphin, or turtle encounters, parasailing, trolley ride, a variety of snorkel options, Atlantis submarine, pirate ship, diving, or beach breaks. This entry was posted in Caribbean, Norwegian, Pearl, Ports of Call and tagged Caribbean, cruise, Georgetown, Grand Cayman, Hell, island paradise, photos, travel, tropical island, vacation. Bookmark the permalink. I have been all over that island, Brac and Little Cayman too having stayed on each a few times, multiple cruise ship and even a liveaboard dive boat trip. The tarpon were one of the more memorable dive experiences as was mucking around way back in the engine room of the sunken Russian destroyer off Little Cayman. My wife and I did the $20 island tour when we were there on the Carnival Legend last year. We think that for twenty bucks it’s a tour that’s well worth the money. We weren’t expecting very much, so we were pleasantly surprised. Haven’t been here…. yet. But I’ll surely remember the $20 tour! Thanks for taking me to Hell. I like the rock formations in Hell. Doesn’t look like a good place to go for a walk but it is cool to see. What were the carbonate loving organisms? If it’s close to water it could be limpits or urchins. I don’t know what eats away rocks away from the water though. Sounds like a very interesting tour. I always enjoy reading about places where I have never been, and probably never will. I didn’t realize the Caymans were such a popular cruise stop. Caribbean cruises are very popular so there’s a lot of ships there. Probably a lot more than there were before the Mexican Riviera cruises dropped from lots to hardly any. All the ships that cruise Alaska in the summer have to go somewhere in the winter. Pretty much anywhere in the Caribbean is beautiful, but there’s only so many places the big ships can go. Curious, we are booked to go on a Carnival Cruise to here and have an autistic son OBSESSED with shipwrecks– BUT the cruise no longer offers the kittiwake excursion! I have no idea why. We are first time cruisers and wonder if you have to book excursion through the cruise or is there a way we can still do the kittwake one? Any suggestions would be GREATLY appreciated. I am getting flack from family that excursions must be booked through the cruise or you will get scammed or miss the boat or something. We often just get off the boat and see what is there. We have also booked excursions through outside sources at times. The advantage of booking through the ship is that it will wait if it’s own excursions are late, whereas it will leave without you if you are out on your own and return late. As long as you get back to the ship on time you are fine to venture out on your own. So if you book the Kittiwake excursion through an outside source make sure it will finish on time. It is a shame the ship doesn’t offer it as it was an excellent excursion. Sorry to hear about the swim with dolphins exhibit. In captivity, dolphins have a lower survival rate than in the wild. They are unable to communicate, hunt, roam, mate and play as they would in the wild. The stress of their confinement often results in behavioral abnormalities, illness, and lowered resistance to disease and death. 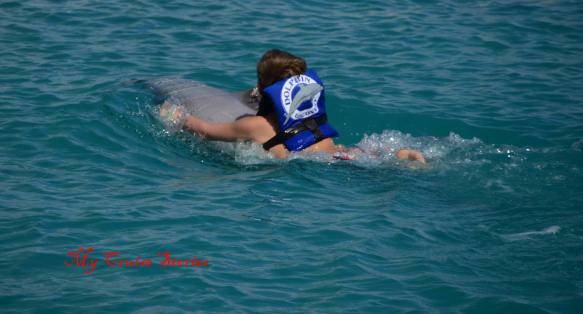 They do however give a lot of people a chance to get up close and personal with dolphins. People are more likely to care about something that they have seen or experienced personally than they are about something they have never seen. The more people who care about any species who lives in the ocean, the more people will care about protecting the oceans. And the oceans definitely need protecting.